Click here to register. Below, we’ll ask you to fill in personal details and choose a password that you will use for subsequent purchases on our website. 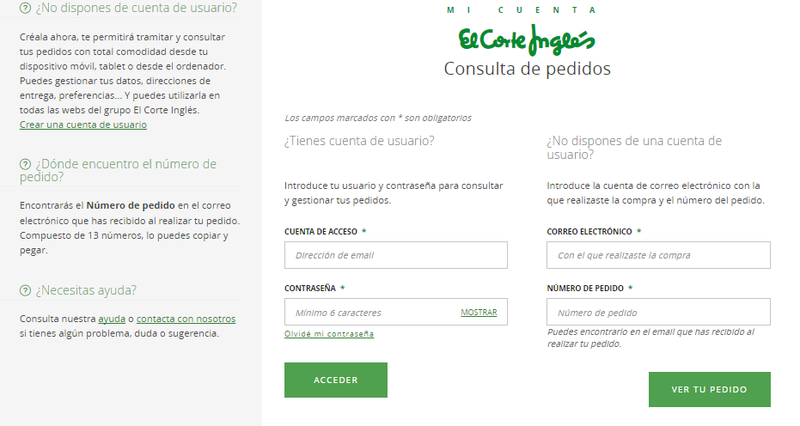 When you register on the El Corte Inglés website, you will be given a personal account that will allow you to purchase products, receive information on special offers and promotions, find out the status of your orders, access your order history, etc. Furthermore, your customer file keeps your personal details and frequent addresses, so you will not have to fill them in each time you place an order. Yes, you need to be registered and logged in to make a purchase. If you need to change any of your details, you only need to access your account. Here, you can access the different sections with personal information (My login details and password, My personal details, My address book) and edit the desired fields. What does El Corte Inglés do with my details? When you register on our secure server or place an order, we add your personal details, address and payment methods to our database. We only use them to process your order and send information on offers and services that you may find interesting, with your prior approval. In accordance with the El Corte Inglés Guarantee of confidentiality and security, we are particularly interested in offering our customers the highest level of security and protecting the confidentiality of their personal details. To do so, all commercial transactions are carried out in a secure server environment using SSL protocol (Secure Socket Layer), and all communications are encrypted using 128-bit encryption to ensure the greatest level of protection. We have an on-screen alert system which identifies mistakes made when entering information and allows the customer to correct them at all times. Information relating to the product or service contracted is filed electronically and customers have access to it at all times. If you do not remember your password, click the Forgot my password link when you go to log in. You only need to provide the email address associated with your user account so we can send you a new password. To view the status of your orders, click on the View My Orders link located in the left-hand menu of your user account. This feature allows you to check the status of your order: pending, out for delivery, delivered, being prepared, etc. If there is no order information available immediately after having placed it, don’t worry. It can sometimes take a few minutes to appear. Can I register as a company or a self-employed worker? Yes, you can register as a company or self-employed worker. Click Register at the top of the page, then click Are you a company or self-employed? Next, we will ask you to fill in some details that you will use for future purchases on our website. Why haven’t I received the registration confirmation email? If you haven’t received the registration confirmation email, look in your Spam or Junk mail folder. It could be there. It is also possible that you have not received it due to a temporary technical issue, and it will arrive in your inbox after a few minutes. Can I add multiple delivery addresses? To add more addresses to your account, click on the My address book link located in the menu on the left-hand side of your user account. You can add or edit as many addresses as you like here. You can also add a new delivery address at the Checkout or when you select if you want to receive the order at home or go to collect it. How do I see My Favourites? How do I empty my list of favourite products? To delete your favourite products, click on the heart icon to the right of the product name. Although it is not possible to mass delete products at this time, you can delete the lists you have created. What is My Payment Methods and how does it work? In the My Payment Methods section of My Account you can save your frequently used payment methods so that your next purchases are faster, easier and more secure. You can save bank cards as well as your El Corte Inglés Card. You only have to do it once, and they’ll be saved forever. You can add several payment methods and also select the one you wish to use as your default payment method. You can easily remove a payment method at any time in the same section. You can also save your payment methods while you are placing an order; more specifically when selecting a payment method in Step 4.